Factory-direct CD duplication and CD manufacturing! Choose CDwest.ca for factory-direct CD manuafcturing and CD duplication with a wide range of eco-friendly print and packaging solutions including CD Digipak, CD Sleeves and CD Jackets. If you'd like to provide your music in a download format but you want to have something tangible you can sell to fans at shows and events, then we've got the perfect solution for you... the Digital Download Card. One of the problems with download services such as iTunes is that people download your music and then you get paid later... sometimes much later... and then you only get a percentage of the selling price. That's not the case with the Digital Download Card service provided by CDwest.ca. ▪ YOU manage your music. ▪ YOU set the price. ▪ YOU collect the money up-front. ▪ YOU keep all of the money with no hold-backs or commissions. ▪ What quantity of Download Cards do you want? ▪ How much do you want to sell your Cards for (you can choose "free" if you want to)? ▪ How many downloads do you want the buyer to have access to? ▪ When will the Card expire (you can choose "never" if you want to)? When your order is ready you'll receive your Digital Download Cards but you'll also receive log-in information to access your own online account where you will manage the music you're making available for download. ▪ Upload a maximum of 25 songs (maximum of 15mb per song). ▪ You can update, remove or add songs at any time. ▪ You can track your download history - who downloaded, and what song(s). If you have questions or comments about the service please feel free to drop by our Surrey, BC office, visit our website or contact us directly by phone or email. We look forward to hearing from you! Located in Surrey, BC (a suburb of Vancouver), CDwest.ca provides factory-direct CD manufacturing with eco-print and packaging, along with an ever-growing list of related products and services including vinyl record pressing, custom USB sticks, and much more. A great price on our extremely popular CS100 eco-friendly CD Sleeve package. 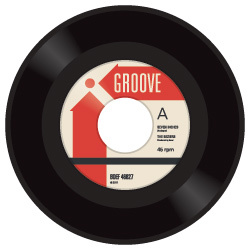 A special introductory offer on pressed vinyl records (both 7" and 12" pressed vinyl). As the sole CD replication plant in Western Canada, CDwest.ca provides factory-direct CD manufacturing with eco-friendly print and packaging solutions. Vinyl record pressing has now been added to our list of products and services along with custom printed USB Memory Sticks. We are very pleased to announce professional vinyl record pressing and pacakging has now been added to our line of products and services! Having partnered with the top vinyl record pressing plant in the USA, we will be providing all of the print and pacakging elements from our own commercial print division here in-house to provide you with the very best in quality, service, and pricing. 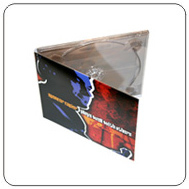 CDwest.ca is your factory-direct source for CD manufacturing with eco-friendly print and packaging. As the sole CD replication plant in Western Canda, we provide you with the best combination of quality, service and price in the market. We are now pleased to also be offering professional vinyl record pressing with eco-packaging and even custom-printed USB memory sticks. CDwest.ca is pleased to announce that we have just added custom-printed USB Sticks to our line of products and services. 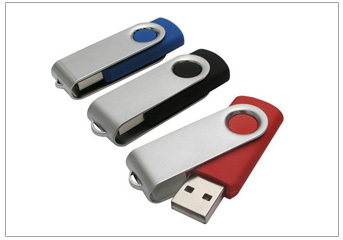 This month (March 2012) we have special pricing available on the very popular and practical "Swivel" style of USB Stick (as shown here in the photo). There's no cap to struggle with or lose, as there is an integral aluminum swivel that doubles as both as a cap and a holder. Please contact us for pricing and details. We have a variety of popular styles, memory capacities, and colours available, along with different print options. If you're looking for a particular style or specification of USB Memory Stick that you do not see it provided on our website please contact us and we'll be happy to assist you with the item you require! For clients who wish to take advantage of our VIP Program 'Free Posters' offer, the poster artwork must be supplied at the time of order. Please note that once your other project proofs have been approved, artwork for the 'Free Posters' offer will not be accepted. Order 300 units ... Get 500! Yes, that is absolutely correct! Place your order for 300 CDs in any of our standard CD Eco-Sleeves or CD Digipak and we'll provide you with not 300... but 500 units! Act now because the order deadline is the end of business day (4:30 pm Pacific Standard Time) on February 10, 2012. If you can't react quickly enough to take advantage of this offer by the deadline date, you can submit your order forms and payment prior to deadline and we'll hold the offer open for you. You can then submit your order assets when they are ready. If you have any questions about us, our products and services, or this special offer - we'd love to hear from you! The entire CDwest.ca team would like to wish you a Happy New Year - hoping that 2012 is a happy, healthy and prosperous year for one and all! We've had a lot of good responses on our running three VIP Special Offers each month (instead of just one) so it looks like we'll be continuing with three for the foreseeable future! > One feature will relate to CD manufacturing or CD duplication orders... either a discount on product or a value added item tied into a CD order. > A second feature will relate to a Commercial Printing product or service from our www.PrecisionPrinting.ca website. > The third feature will be a bit of a wild card... we'll just have to see what we can do with that one on a month-to-month basis. Factory-direct CD and DVD replication manufacturing as well as duplication of optical disc media complete with eco-friendly print and packaging solutions. When you work with us you're dealing with the company that actually manufactures your CDs or DVDs - not a middleman - so you benefit from the great pricing, quality products and the superior service that dealing 'direct' provides. We ship daily to clientele throughout North America - and we hope that we can be of service to your in the near future. Visit our website for an instant online quote or call us toll free at 1.866.530.0770.